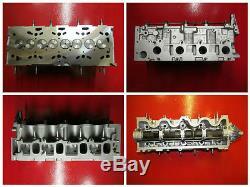 VAUXHALL 1.9 CDTi 8V FULLY RE-CON CYLINDER HEAD. ASTRA / VECTRA-C / ZAFIRA / SIGNUM. COMPLETE WITH CAMSHAFT AND BUCKETS CASTING NUMBER. HEAD PRESSURE TESTED TO 80 psi. VALVE GUIDES CHECKED AND REPLACED IF REQUIRED. VALVES REFACED OR REPLACED IF NECESSARY. VALVES SEATS REFACED AND VACUUM TESTED. HEAD REFACED BY THE MINIMUM AMOUNT. ALL PARTS CLEANED AND ASSEMBLED WITH NEW SEALS WE CAN ALSO SUPPLY NEW HEAD BOLTS, HEAD GASKET SETS AND TIMING BELTS. EXCLUDES IRELAND, CHANNEL ISLANDS & HIGHLANDS, CODES BT ECT. We will accept your old cylinder head no matter what it's condition, as long as it includes all the parts that our head came with. You will never be charged extra because your old head is damaged. (as long as you put all of the parts in a box). We have no up-front core charge , you have 28 days to return your old unit. Just make sure your old cylinder head is wrapped up with our address on, then please ring our office (01942 321199) to arrange collection at. The item "VAUXHALL ASTRA VECTRA-C ZAFIRA 1.9 CDTi 8V FULLY RE-CON CYLINDER HEAD 55193091" is in sale since Wednesday, July 25, 2018. This item is in the category "Vehicle Parts & Accessories\Car Parts\Engines & Engine Parts\Cylinder Heads & Head Covers". The seller is "engines001" and is located in Wigan, Lancashire. This item can be shipped worldwide.